The world is witnessing the paradigm shift in recent trends and technologies in retrospect of cloud management requirements that are evolving around the hybrid and multi-cloud models. The Managed Services Providers (MSPs) play a very crucial role in channelizing the cloud managed services of any organization deep into the market. The MSPs also sell migration services that shift customer from private cloud to public clouds. The MSPs help users to move their applications to the cloud, sell their cloud services, and manage and optimize those services, as well. This has boomed the cloud managed services and its market with a lot of merger and acquisition activities happening over the cloud. The cloud managed services boost the enterprises to reach the marketplace faster, better, and cheaper. 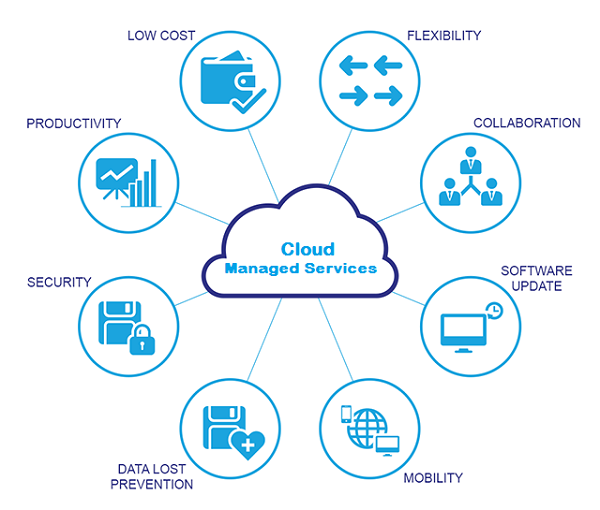 As the global cloud managed services market is expected to reach a whopping USD 82.51 billion by 2021, enterprises are focusing on their primary business operations that might result in higher rate of adoption of cloud managed services. FYI, these cloud managed services consists of business services, data center services, security services, network services, and mobility services as a major category. Deploying these services help users to reduce the It and operations costs which eventually enhances the productivity of the concerned enterprise. How these Cloud Managed Services supports MSPs? Let us know how this booming cloud managed services sector is going to help the MSPs for the future enterprise growth. Customized Solutions: The managed services these days are customized based on the user specifications and enterprise requirements. So, it is easier for MSPs to channelize the services in the market accordingly rather than understanding the requirements first, and then deciding which is better. Proactive Support and Maintenance: The cloud managed services offer proactive support to their providers that later help users to identify the potential issues beforehand and reduce then to minimize the downtime. Operational Efficiency: The operational efficiency of the MSPs depends widely on the growth and innovation of cloud services management. Better managed services will lead to better strategic initiatives and technological planning of the MSPs. Bottom-Line: The growth of cloud managed services enable the providers to augment competencies that they lack, or to replace processes that were traditional and incurred huge recurring costs. This helps the MSPs optimize their services and transform the IT infrastructure of their clients to automate their business processes and help them achieve business goals. If you are keen to avail managed public cloud services for your enterprise but need a managed service provider to do so, contact i2k2 Networks, a dedicated web hosting services provider, with a 20-years business continuity and proven record in the market. The cloud expert team of i2k2 not only help you reduce your IT infrastructure and administration costs but also promises to deliver unmatched efficiency through dedicated web hosting managed services that result in drastic reduction of the Total Cost of Ownership (TCO) of your organization. Call us at +91-120-466-3031 | +91-971-177-4040 or you can even drop a mail at sales@i2k2.com.